True West by Sam Shepard is considered one of the great American plays reflecting the country’s changing idealism in the late 1970s. For the playwright, you could say the American Dream never existed in the first place, especially with Shepard having struggled with the family farm and a father who drank too much. Shepard’s life is perhaps best seen as one that was, paraphrasing Richard Gilman on the movie American Graffiti, “only tougher, shrewder, more seeded with intimations of catastrophe in the midst of swagger.” True West, written in 1980, was Shepard’s seventh play and it’s considered a work that intentionally looks at the clash of one idealistic man against his wayward, independent brother. The dramatic conceit is to use the strained relationship of two brothers, Austin and Lee, as a political and social device offering Shepard’s commentary on the false underpinnings of American culture. 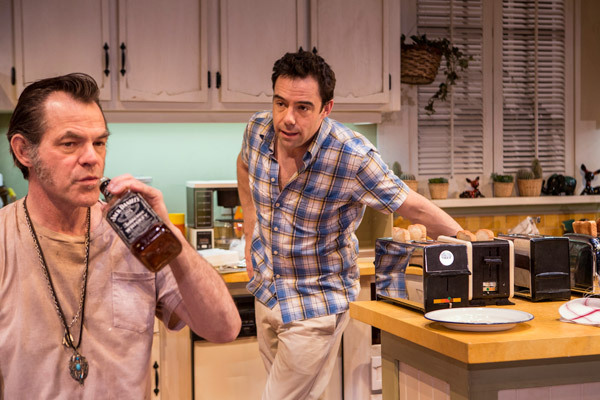 After seeing True West you immediately see the author’s disenchantment. It’s an edgy play that wears its political heart on its proverbial sleeve. Toronto’s Soulpepper production, which opened April 3rd, is adorned with that edginess from start to finish. Right from the opening lines to the dramatic standoff between the brothers, played by Stuart Hughes (Lee) and Mike Ross (Austin), the masculine swagger rarely lets up. On this point, director Nancy Palk and the cast understand Shepard, his point-of-view and his social commentary. It’s also a production that easily finds the black humour of the playwright, which is almost absurdist in its evolution during the course of the play’s 90-plus minutes. Stuart Hughes is marvellous as Lee, the older, pragmatic and slightly reckless brother. Austin is the younger, straight-laced member of the family who’s working on a screenplay for a Hollywood movie. He’s left the distractions of Los Angeles and settled into his mother’s suburban house in central California. She’s on vacation in Alaska asking her youngest son to look after the plants while she’s away. Lee shows up, unexpectedly, after spending a long time in the desert. “I been spendin’ a lot a time on the desert…had me a Pit Bull there for a while but I lost him.” He barely accounts for himself in the story and his vagueness adds colour to his mysterious character. Ross plays Austin in a defensive mode through most of the play, often backing off his brother’s swagger too quickly for me. Austin is also trying to connect to his brother in a deeper way, motivated by their father’s alcoholism and their mother’s ambivalence to their dysfunction. As a family, Austin sought solace in the values of his country while Lee simply hit the road and lived a hand-to-mouth existence. In some ways, both characters live the dream: Austin over-achieves and seeks out his financial rewards while Lee appreciates the freedom to do whatever he wants. The irony in the play is that neither one of them is satisfied by their limited desires, but they still have each other. Unfortunately, one of the weaknesses of the play is the under-developed relationship between them. 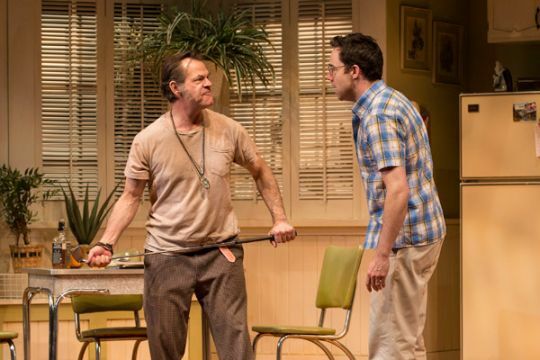 Lee and Austin need each other on a deeper level, but in True West, which is more concerned with making a political statement, their relationship suffers. Nevertheless, there are hints of Austin’s desire to connect with his brother and I would have liked to see Ross play the subtext with more strength. It would’ve added more empathy to the work which has a tendency to be over-the-top with its physical display of competitiveness between the lead characters. Having studied the play in theatre class many years ago, I was directed to follow that subtext more closely because that’s what unites the commentary and comedy of the work. Perhaps Soulpepper’s production, which closes May 4th, will quickly find that important human element in True West. Nevertheless, Palk has done well to capture the Shepard angst, his love of music that transitioned the scenes and his sense of the absurd. But I would have liked more heart in this production, which would have bumped up the intensity of the action rather than just soften its sharp edges. In other words, there wasn’t enough at stake to feed the wants of the two characters. This is partly the fault of the playwright. All plays have ebb and flow about them. That keeps the audience engaged and the actors on their creative toes, but this production was a little too steady for its own good. The stakes needed to be raised even higher to create a deeper response from me. – John Corcelli is an actor and theatre director.